It’s kind of refreshing not to hear more resolutions and retrospectives. It makes me tired to think about them too much. An Ivy League Vest, that will be beautiful to watch grow. Yay for an ILV, and for the thrummed mitts! I want to do a pair of those too, especially since the temperatures keep dropping. Nice job on yours. I skipped the retrospectives and resolutions too. I think it might be a useful exercise for some, but I’d prefer to just get on with it! I’ve been seeing lots of thrummed mittens lately, and was wishing that I lived somewhere that got cold enough to be worth the effort…now, maybe not so much. happy new year! i’m also looking forward to 2008! you know, i HAVE to do a retrospective because my memory is CRAP lately!! 🙂 i can’t remember everything that i did the year before! hahaha. Oh, those look wonderfully warm! Hee hee – but by using sheep fuzz instead of dog fuzz, the mitts won’t smell like wet dog when they get wet… Happy New Year! I have a gallery and then there is flickr, I felt like the recap would have been overkill for me, and resolution oi. I am with Liz, I would rather get on with the business of living and doing. Happy New Year! Oh, and those mittens? Awesome. The mittens are GORGEOUS. I hope they see action, like the hat in your recent post. There’s something so attractive about men in handknits, especially working! So are they TOO warm? Can you move your fingers? I have wanted to make some, but am not sure. Gorgeous colors for your vest! Happy New Year to you, Elinor! Hmmm… I was going to knit the Bird in Hand mittens with Lamb’s Pride. Although felting in a mitt is OK, I think. We’ll see. Those thrummed mittens look so great, and so warm! Thrummed mittens must be “in”. Althougth, mittens in the midwest are alway “in”. Yours look so warm and toasty. Can’t wait to see your ILV in your new colors. Those are fantastic! Happy New Year! 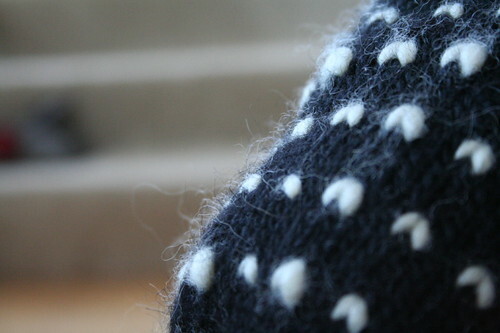 You thrummed mittens look great, even if you aren’t a fan of the main yarn you used. They’re gonna be super warm. I like the colors you’ve chosen for the vest. I’m on the fence with that pattern, and I am curious to see how yours looks. Those mittens looks so warm and fluffy. I used some Lamb’s Pride a few weeks back and it is extremely hairy. My entire shirt/pants would be covered at the of the knitting session! Yeah, that’s what I’m talking about! 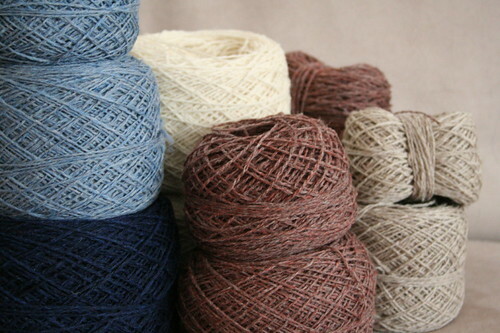 No year in review, and no promises about knitting from the stash! Me neither!!! Happy New Year to you! And congrats on the sweet thrummed mitts. Hee hee, I love the special “signature” thrum that you included! Happy New Year! I love the colors for your Ivy League vest! Soft and rich simultaneously. Great mittens too, and I’m certain they will be very warm. I’m with you on ignoring the whole 2007 retrospective/2008 resolution thing. I *heart* that pie plate! Where did you get it? Those mittens are ginormous! They will definitely keep you toasty warm. Beautiful mittens! 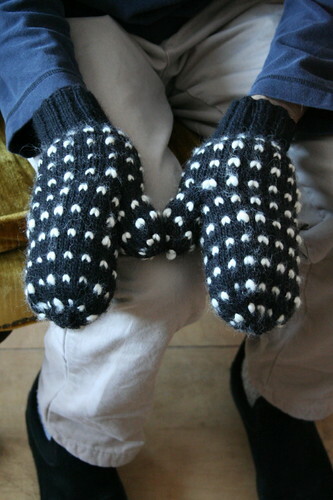 I did a pair of thrummed mittens a few years ago for my fiance’s grandmother and she loved them! I used fiber that she had spun and hand-dyed to make them, too. She used to teach workshops on natural dying. Too bad she doesn’t have her spinning wheel or supplies anymore. She gave them away a year before the boy and I got together. At this point, I too am a little weary of year-end reviews. Time to move on to 2008, I say. Your trums are lovely. So are the colours for your vest. Can’t wait to see it in all its stranded glory. Is there a web site that shows how to put the thrum in a slipper or mitten while knitting. I cannot get mine to look correct I am sure I am doing it wrong when I knit it with the regular stitch.